Mind is the womb of Saraswati, wherein all wisdom rests, and from which comes forth all meaning. The more I seek My Lady, the bigger she seems, and yet the more familiar she becomes. She is as vast as the heavens and the ocean, and yet remains an intimate friend and a beloved teacher. 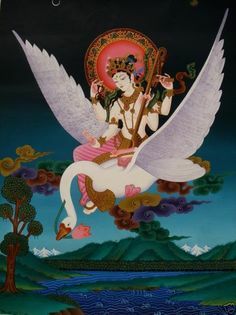 Is she Saraswati, Yangchenma, or Benzaiten-sama? Is she all of these or none of these? Some of these or some others? When I ask, the answer is merely, yes.